A fellow survivor I know braved the apocalyptic streets to deliver this belated birthday gift to me. 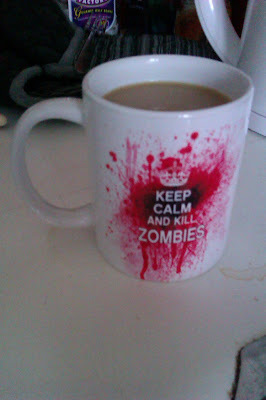 A mug with the wise words 'Keep Calm and Kill Zombies' which anyone with eyes would already have read. The 'Keep Calm and...' products have become popular here in Britain, I approve of the zombie spin off merchandise. 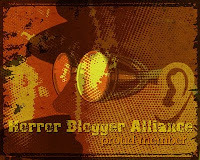 There shouldn't actually be blood on the mug, that was a desperate attack on a weak headed ghoul that caused that...the Rotting Zombie HQ defences are not that tight! Good for drinking tea from; love me my tea.